I’ve always been a big fan of coffee over espresso because of difference in the volume of liquid between the two. A double-shot of espresso for instance is only 3.5-4oz compared to my standard 6-cup brew of coffee I tend to make every morning. What I’ve found to be a great middle ground between the two is the common Americano (pictured left) which is espresso mixed with hot water. 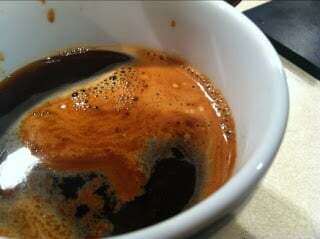 Sure you could call it watered down espresso but I prefer to call it fancy coffee because it rivals the volume I’d get out of my coffee maker but the drink itself is just better. My wife in fact has come to a point where she won’t drink coffee at all. If she’s not drinking Earl Grey she’s drinking an Americano. It’s espresso or nothing for her. This all got me inspired to find an economical way of making good espresso from home so that we both could enjoy a cup together and this is what I came across. The best way to get espresso at home is to use freshly roasted beans from a local company. People that I trust have convinced me that local (small) roasters tend to be the best places to get freshly roasted beans. Then, the exact time you are ready to make your espresso you grind your beans. You don’t do it at the market or days in advance, you do it on the spot with a conical burr grinder. This ensures the best flavor possible. Yeah, you can easily overspend on burr coffee grinders but I like simple products and they tend to be the cheapest. A simple hand crank grinder like this one is awesome if you have the patience to use it. 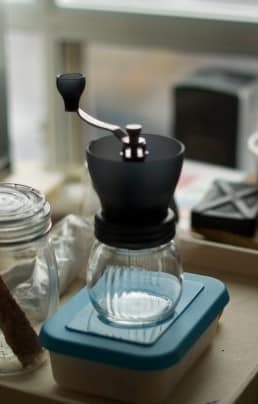 Using a slightly coarser grind than espresso grind you then put your ground beans into one of these super affordable stovetop espresso pots (small, medium, large) and bring it to a boil slowly. Let the boiling action of the water work it’s magic. The steam forms the pressure needed to make good espresso. It’s amazing that this contraption is so simple and cheap yet people readily spend hundreds for a fancy machine that’s typically far more complicated to use, keep clean, or service. The stovetop unit wont froth milk but for straight espresso, americano’s and some after-dinner coffee drinks all you need is the classic stovetop pot shown above. You can see more top rated stovetop espresso pots in the store. What’s great about making your espresso this way is that you have full control over the water, grind, beans, and ratio of espresso to hot water that is used. No longer do you have to settle for a 4:1 ratio at a coffee bar using regular tap water. You can bust out your bottled water and take whatever steps you need to to make the best cup possible for your own tastes. How do I love coffee? For sure, there’s the usual brewed coffee to perk up my daily mornings and get me ready for the grind. I also love latte and cappuccino. I enjoy these drinks when catching up with friends. But when I tried espresso, it was pure love. At first, I thought it would be too bitter for my liking. Espresso is pure, unadulterated coffee love. No wonder many coffee aficionados invest on a good espresso machine so they could have espresso at home, anytime they want it. For some coffee lovers, getting an espresso machine may not always be an option. What to do now? Fortunately, there are smart ways and ingenious methods to make espresso at home without a fancy espresso machine. How? Let’s find out. Many people think that espresso is black coffee. It’s easy to understand why there is a common misunderstanding. Espresso is coffee, yes. But not every black coffee is espresso. Espresso is made from forcing very small amount of pressurized hot water into fine ground espresso beans. This process creates a thick crema that sits on top of an espresso shot. Often, specialized espresso machines are needed to introduce that kind of pressure. While pressure is an important element in making espresso, there are two other factors needed to yield a good espresso – roast and grind. Coffee roasters know that roasting coffee can create variations in the final coffee product. This is especially true for espresso. Making espresso requires a special kind of beans. Often, roasters make an espresso roast. This is a darker roast that yields a stronger and bolder coffee flavor. The taste and aroma is distinctive from regular drip or brewed coffee. If you plan to make espresso at home, be sure to buy an espresso roast and grind beans on demand so you can get fresh tasting espresso at home. Making a cup of espresso requires a special kind of grind. Unlike regular brew that needs coarse ground coffee, espresso needs find ground coffee. Fine ground coffee slows down water penetration; thus, pressure is needed to extract the espresso kind of coffee. Again, it’s impossible to make authentic espresso without an espresso machine because pressure plays a key role in extracting a great tasting espresso shot. However, you can make an alternative espresso coffee at home. Check these methods. Using an Aeropress can be the cheapest and most acceptable espresso alternative. An Aeropress requires manual pressure. Through this, you can probably achieve about a pressure gauge of 3 bars. This seems good enough, since an espresso machine creates 9 bar pressure. At least, you have one third of the required pressure to extract espresso. In addition to the use of pressure, you can control temperature and brew fine ground espresso beans. This avoids burning your beans. Heat up water up to 180 degrees Fahrenheit. Prepare 17 grams of coffee. Grind the coffee, aim for a semi-fine ground coffee. Clean a paper filter and place it inside the Aeropress. Add 50 grams of hot water, for steeping. Let it steep for 30 seconds. Stir to steep the grounds evenly. Add the remaining water slowly. Press the plunger very slowly. Pour the coffee in cups. Moka pots remind us of traditional coffee brewing method. One of the challenges with using a moka pot for espresso is water temperature. Moka pots need high temperature to create pressure. When water is at the boiling stage, it creates a nice pressure that can be used for espresso alternatives. However, that same amount of heat can burn coffee and cause over-extraction. This is very far from our beloved espresso. Fill moka pot with hot water. Grind coffee beans that is finer than drip coffee. Fill the coffee filter loosely. Do not pack the grounds. Make sure that the rim is clean to lock in the pressure when the water starts boiling. Place under medium heat, using a gas stove. Wait for the water to start flowing in the top reservoir. 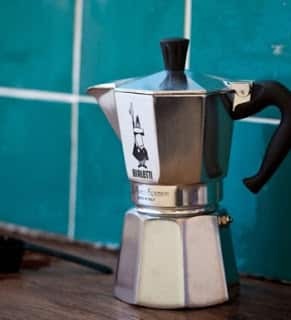 Once coffee is flowing, remove moka pot from heat. The remaining temperature will finish the process. This is another manual brewing method that you can master to create an alternative espresso. It may not create enough pressure like the Aeropress, but there is a simple technique that you can use to make an almost-espresso drink. Grind your coffee very fine, using very dark roast beans or espresso beans. Two tablespoons of beans for every cup of water. Fill your kettle with water. Heat the water to boil and let it cool down for 30 seconds to achieve the perfect temperature before brewing. Add the coffee grounds to the French press. This amount is almost double the of what you normally use for French press. This allows you to create a darker and bolder brew, similar to the espresso, but without that creamy final note. Add some hot water from the kettle. Let it rest for a few seconds. This will help make the coffee bloom to release its oils and aroma. Add the remaining water. Avoid stirring. This will cause the grounds to fall out of suspension and potentially ruin the extraction of tasty coffee flavors and richness. Close the lid but don’t press yet. Let the coffee steep for about 4 minutes. If you prefer a stronger flavor, add a couple of minutes more. After steeping, press down the plunger halfway, with slow, steady and even pressure. Raise the plunger atop, then give it a good final plunge all the way down to finish the process.